There are two kinds of professional books. One kind stays on the shelf and is in pristine condition because it is rarely opened. The other kind of professional book looks battered. It has a cover that is worn from being placed daily in your book bag. There are several pages that are dog-eared and sticky notes abound. Perfect Pairs definitely belongs in the latter category. In the text, two picture books are the anchor for each life science lesson. For example, Plantzilla and A Seed is Sleepy are the featured books for a second grade lesson titled How Plants Change as They Grow. I love how this book is designed. The authors lay out each lesson with easy to follow steps. First off, two picture books are briefly summarized. A wonder statement, accompanied by a learning goal, follows the two summaries. Being curious and knowing where you’re going are important in a lesson. The next steps in the lesson areEngaging Students and Exploring with Students. In the changing plants lesson, students play concentration with seed and plant cards made from A Seed is Sleepy. One of the purposes of playing the game is to look for connections between the cards. From there, students explore by reading both books and comparing real plants with the fictional Plantzilla. The teaching steps are laid out for you, but it doesn’t strike me as too didactic. There are places for students to turn and talk and to use a chart for comparing. These are important skills for a second grader to practice and the steps keep the lesson engaging as opposed to a talky 15-20 minute mini-lesson. The following step ties everything together by Encouraging Students to Draw Conclusions. In this lesson students write a letter to a character in Plantzilla comparing fictional and real plant changes. They also draw pictures of plant changes and address a set of True/False statements. Each Perfect Pairs lesson will take about a week to complete if you have 30-45 minutes for science each day. There are 7 lessons in kindergarten, 8 lessons in first grade, and 7 lessons in second grade, but you can take lessons from any of these grade levels and tweak them to fit your grade level. These lessons are thoughtful and engaging. There’s no fluff here but instead meaty science teaching and learning. I use and like Teachers Pay Teachers, but some of their lessons are rather thin because it takes a lot of time to construct lessons with deep learning. When you get a copy of Perfect Pairs, you save time because you have 22 lessons from two highly skilled educators in Melissa Stewart and Nancy Chesley that will challenge your students to really dig into life science. Encourage your media center specialist or principal to purchase this book. 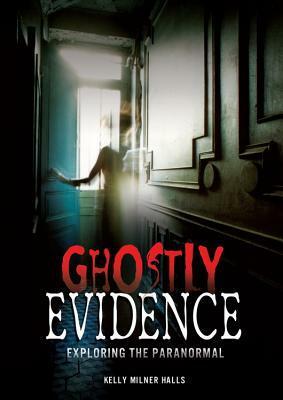 Check out the website for more reproducibles related to the book. Ah, the Cybils nominations for elementary and middle grade nonfiction are almost complete, and what a wonderful list it is. 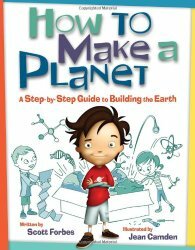 Today at Wrapped in Foil we reviewed How to Make a Planet: A Step-by-Step Guide to Building the Earth by Scott Forbes and illustrated by Jean Camden, a middle grade title from the list. How to Make a Planet… races through the consensus of what scientists have discovered about our universe so far, from the best estimate of the time of the Big Bang (13.7 billion years ago) to when the Earth formed (4.7 billion years ago) to modern times using the premise of building a planet as a way to keep the information focused. At the same time, the text hurtles through various fields of science, encompassing astronomy, physics, chemistry, earth science, geology and even biology. Although it covers so much territory, it is still easy to read and understandable because Scott Forbes has done an excellent job of organizing and condensing the material. The book will help make big numbers and mind-blowing concepts accessible to everyone. Even though the book covers a lot of territory and a lot of time, the bottom line is that our planet is a unique place and that we should take care of it. It is definitely a good resource for units on astronomy and earth science, particularly those covering the solar system. Despite the title, Brown Girl Dreaming is most certainly not just a book for brown girls or girls. Jacqueline Woodson’s memoir-in-verse relates her journey to discover her passion for writing. Her story is framed by her large, loving family within the confines of the turbulent Civil Rights Era. Sometimes a book is so well-received, so popular, that it seems that enough has been said (and said well); anything else would just be noise. Rather than add another Brown Girl Dreaming review to the hundreds of glowing ones already in print and cyberspace, I offer you links to other sites, interviews and reviews related to Brown Girl Dreaming. And, I’ll pose a question on memoirs in children’s literature. 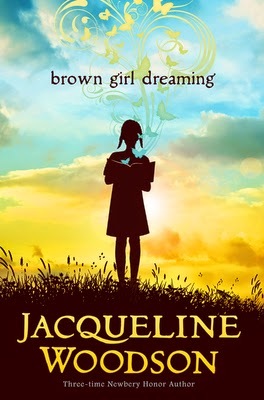 Brown Girl Dreaming is a National Book Award Finalist in the Young People’s Literature category. Jacqueline Woodson was interviewed on NPR regarding Brown Girl Dreaming. Read an excerpt from Brown Girl Dreaming here. Even the prestigious Christian Science Monitor carried a review of Brown Girl Dreaming – the review written by award-winning author, Augusta Scattergood. As a librarian who often helps students in choosing books for school assignments, I have written many times about the dreaded biography assignment – excessive page requirements, narrow specifications, etc. Obviously, a best choice for a children’s book is one written by a noted children’s author. Sadly, many (by no means all!) biographies are formula-driven, series-type books that are not nearly as engaging as ones written by the best authors. Rare is the author of young people’s literature who writes an autobiography for children as Ms. Woodson has done. When such books exist, they are usually memoirs focusing only on the author’s childhood years. This is perfectly appropriate because the reader can relate to that specified period of a person’s lifetime. Jon Sciezska wrote one of my favorite memoirs for children, Knucklehead, and Gary Paulsen’s, How Angel Peterson Got his Name also comes to mind as a stellar example. These books, however, don’t often fit the formula required to answer common student assignment questions, i.e., birth, schooling, employment, marriages, accomplishments, children, death. Students are reluctant to choose a book that will leave them with a blank space(s) on an assignment. I wonder what teachers, other librarians and parents think about this. Must the biography assignment be a traditional biography, or can a memoir (be it in verse, prose, or graphic format) be just as acceptable? I hate to see students turn away from a great book because it doesn’t fit the mold. If we want students to be critical thinkers, it’s time to think outside the box and make room for a more varied, more diverse selection of books. See this and all of my reviews at Shelf-employed. An ironic yet informative alphabet that defines the most important gaming terms that everyone needs to know, Attack! Boss! Cheat Code! A Gamer’s Alphabet is the ultimate crossover gift for our age, a book that can actually bring together video game-obsessed kids and their often perplexed parents. Okay, I know I’m showing my geeky gamer girl side, but I love, love, love this book, and I think today’s young (and not-so-young) readers will, too! Click here to read the full review and find out why. Loree has been traveling this fall, but she took a few minutes to answer some questions about her new book over at Archimedes Notebook. 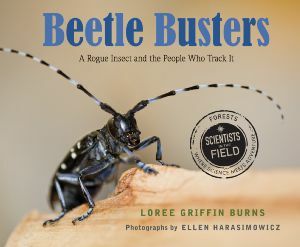 She talks about her research for this book and what kids can do to help scientists monitor these beetles. Booktalk: What’s more fun than celebrating Halloween? Try drawing Halloween! Become an artist, and learn to sketch the sights and symbols that make this holiday special. 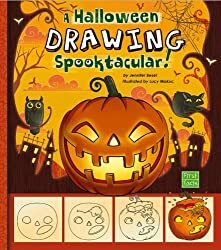 It just takes a pencil and a spooktacular attitude! Tip 1: Draw lightly. You will need to erase some lines as you go, so draw them light. Tip 2: Add details. Little details, such as cobwebs or eyes, make your drawings super scary. Tip 3: Color your drawings. Color can make a creepy drawing even scarier!